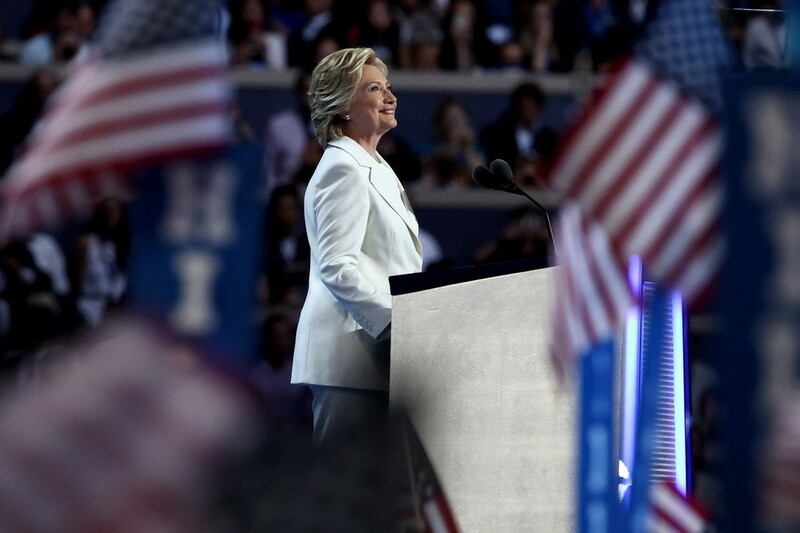 With her Republican counterpart Donald Trump reaping the post-convention benefits in the polls, Hillary Clinton had her chance to impress at the 2016 Democratic National Convention in Philadelphia. The event was Clinton’s golden opportunity to display a sense of unity among her Democratic peers, an effort made more complicated by the leaking of incriminating emails from members of the Democratic National Committee on the eve of the convention. Hillary Clinton is more seasoned than most in dealing with the intense scrutiny of American politics, having been put in the spotlight innumerable times while First Lady, Secretary of State and Senator of New York. But the WikiLeaks reveal the day before the start of the convention must have caused worry even for Clinton who, of course, is no stranger to email scandals herself. The emails purported to show some DNC members trading ideas as to how to sabotage the campaign of Bernie Sanders, and lay claim to the view that the Democratic Party was unfairly biased towards the Clinton campaign from the outset. The White House and the Clinton campaign has been quiet on the issue, with the latter focusing on blaming Russia’s possible involvement. Debbie Wasserman Schultz, chairwoman of the DNC, resigned following the breach and has been followed this week by CEO of the Democratic National Committee, Amy Dacey and several other top staffers. Otherwise, the revelations were largely brushed over at the convention, but remain a threat to unity within the Democrats at a time where they could really be capitalising on the current Republican mayhem. On the subject of emails, one of the biggest controversies dogging Clinton’s claim to legitimacy this time around is of course, “Emailgate”. 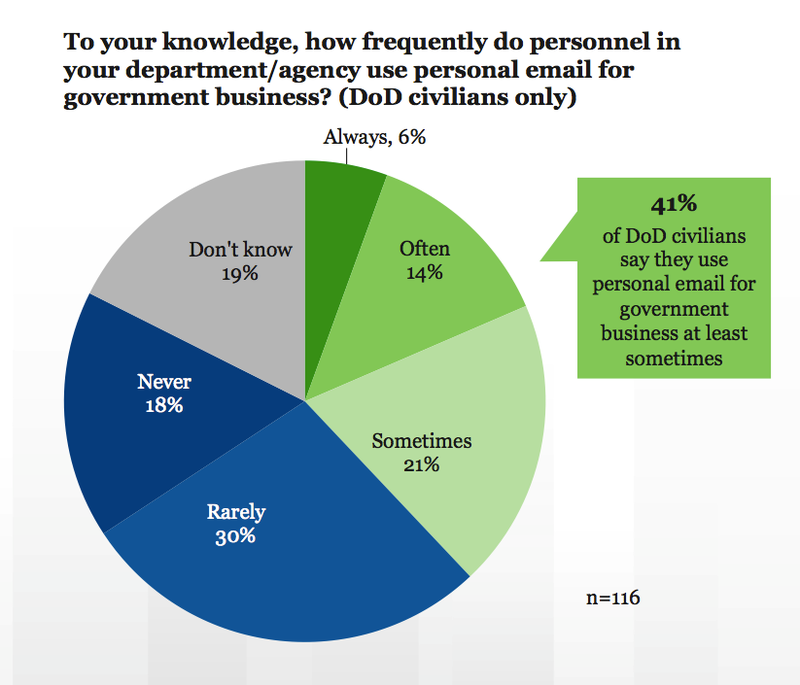 A closer look will show Clinton isn’t alone in her use of personal email servers; a Government Business Council survey taken in February of this year indicated that 41% of the US Department of Defence claim to have used personal email for government business at least sometimes, 14% of whom said they do so “often”. Hope and unity were the themes of many of the speeches given over the course of the four days, with Sanders and First Lady Michelle Obama both leaning heavily on the “we are better together than divided up” rhetoric in their addresses. President Obama gave an impassioned 45-minute oratory where he artfully contrasted Trump’s shortcomings with the work he, Clinton and the Obama administration have done over the past eight years. Whatever his successes and failures as President, Obama’s incredible prowess as a speaker cannot be denied. His speech on Day 3 of the convention ebbed and flowed with subtlety that has barely faltered since his own presidential campaign back in 2008. He displayed a hopeful enthusiasm for progress and unity that was a marked contrast to the rather depressing rhetoric trotted out by many of the Republicans at their convention. “Don’t boo, vote”, was his response when sections of the audience booed at the mention of Trump’s name. It was a classy moment which epitomised the grace Obama so often shows, and which will be sorely missed whoever America chooses as its next President. It would be wrong to suggest it is only Trump dishing out the criticism, however; Clinton and the Democrats are giving as good as they get, as shown by the repeated denunciations of Trump’s campaign at the convention. Michelle Obama criticised Trump’s questionable language towards minorities while Clinton claimed that he lacks the “temperament needed to be commander-in-chief”. Popular Senator Cory Booker launched one of most direct attacks on Trump in a ferocious rally cry where he urged citizens to unite and “rise”, humorously proclaiming “love always trumps hate”. Vice President Joe Biden was equally as strong-worded, explicitly saying that Trump would “literally make [America] less safe”. Clinton rounded off the anti-Trump rhetoric, stating “A man you can bait with a tweet is not a man we can trust with nuclear weapons”. 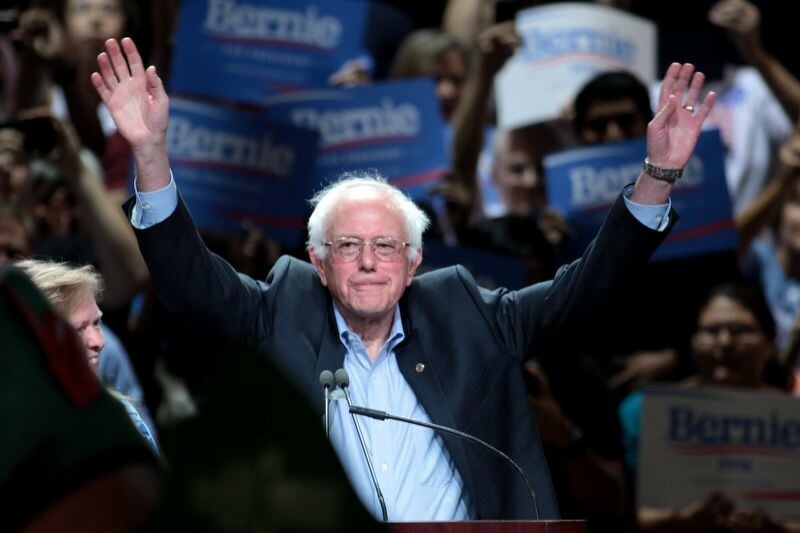 Bernie Sanders – A Revolution Unravelling? One man who was always going to play a part in the convention was Bernie Sanders. The Vermont senator joined the Democrats as a previous rank outsider and big party sceptic, but stunned many experts by running a remarkably determined campaign and winning 22 states over his much-favoured competitor. Sanders supporters have been among the most vocal and passionate during this primary season, regularly attending his rallies in their thousands and furiously chanting his “Feel The Bern” slogan. He has been especially popular with young people, notably for his democratic socialist vision for reducing inequality and opposition to the excessive power of the establishment. Since Clinton unofficially won the nomination in June, Sanders has been dragging his feet over his support of her. First, he resolutely vowed to remain in the race until the convention. Then he, well, partly endorsed her. But it took over a month for him to officially throw his support behind Clinton, standing on stage with her at a rally just a couple of weeks before the convention. While some Sanders fans have pledged their support for Clinton, many Bernie fans booed various speakers on the first day of the event in Philadelphia and staged a walkout when the votes were cast on day 2. Sanders was very clear to his supporters regarding respect and conduct at the convention. Will the Sanders movement fizzle out when the last campaign flyer has been binned, or a year down the line? Or will it continue to grow in its pursuit of a more progressive Democratic party? At this stage, it really is impossible to tell. The angry supporters showed their intent to carry on the Bernie ‘revolution’ at least for the time being, whether Sanders himself is involved or not. In Donald Trump’s acceptance speech at the RNC, he decried Clinton’s political tenure as one of “death, destruction, terrorism and weaknesses”. But as the weeks go by, Trump is proving time and time again why he has been called “unsuitable” to be President by Barack Obama. His insulting of the Khan family, whose son was killed in Iraq in 2004, and claiming that the election itself may be “rigged” has even led to some top GOP members endorsing Clinton. The DNC bounce and Republican chaos combined have seen Clinton’s five-point lead almost double since the convention. 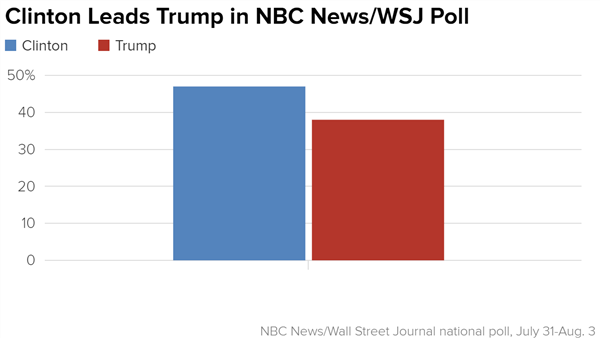 According to the most recent NBC/WSJ poll above she now leads Trump by 47% to 38%. The questions over her overall likeability and trustworthiness remain issues for Clinton, but as Trump’s campaign becomes increasingly chaotic, those issues might not even need total rectification for her to win the election.